OMAHA, NE – Members of the LGBT Community met with John Ewing, candidate for Nebraska’s 2nd Congressional District on Wednesday, August 8th. Many of the issues discussed related to LGBT issues, marriage equality, education, jobs and Lee Terry’s consistent lack of leadership. The meeting was organized so John Ewing could have a chance to listen to members of the LGBT Community and their concerns. Sadly, one attendee mentioned that this was the first meeting any Congressional candidate had with the LGBT Community since Peter Hoaglund. I think this demonstrates the kind of leadership we will see when we elect Ewing to office, a candidate who will make that effort to listen to his constituents. John Ewing did mention that the most important things he wants to do in office for Omaha is ensure people are treating with respect and dignity, as well as bringing jobs to the area. If you missed this chance to meet John Ewing there will be a Joint Obama-Ewing Block Party near the Ewing HQ at 343 N 76th St in Omaha. That is near 76th and Cass, right behind the KwikShop! Don’t forget to like John Ewing’s FaceBook Page! 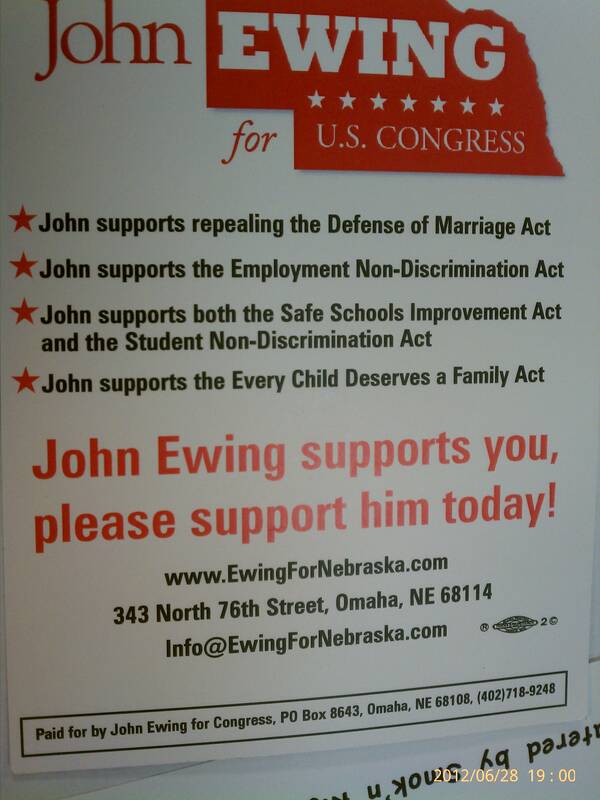 John Ewing Supports LGBT Issues, Please Support Him Today!